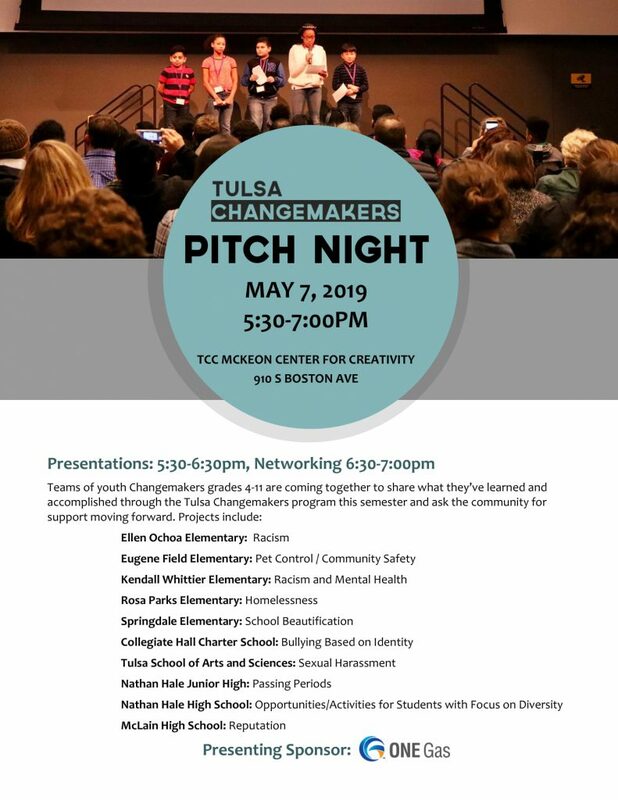 Teams of youth Changemakers grades 4-11 are coming together on Tuesday, May 7th from 5:30-7:00pm at the TCC McKeon Center for Creativity to share what they’ve learned and accomplished through the Tulsa Changemakers program this semester and ask the community for support moving forward. Projects include racism, pet control/community safety, racism and mental health, homelessness, school beautification, bullying based on identity, sexual harassment, passing periods, opportunities/activities for students with focus on diversity, and reputation. Entry is free of charge. Parking lot is on the west side of the building. Entrance is on the north and east sides. Come ready to network with the Changemakers and find ways to support their initiatives. RSVP on Facebook or Eventbrite. Schools Represented: Ellen Ochoa Elementary, Eugene Field Elementary, Kendall Whittier Elementary, Rosa Parks Elementary, Springdale Elementary, Collegiate Hall Charter School, Tulsa School of Arts and Sciences, Nathan Hale Junior High, Nathan Hale High School, and McLain High School.